David Silva is quite a player, isn’t he? Shorn of many outstanding individuals, Silva has risen above the challengers to claim the crown as the Premier League’s top talent. But perhaps, therein lies the question.Manchester City-Arsenal was a great advert for the league, argues Michael Cox for ZonalMarking.net – it was played at a pulsating pace, full of trickery and cunning and not to mention great technical ability – but it lacked a certain control the best European counterparts, Real Madrid, Bayern Munich and FC Barcelona, are masters at. Indeed, is it that the hectic nature owes in part, to the failure of English sides in the Champions League and thus the extra space allowing David Silva to become the best in the league? Cesc Fábregas talks similarly of the Premiership, saying in Four Four Two magazine as being “alocado” (crazy). On the other hand, a mix of continental astuteness and British urgency has seen Fábregas start the season wonderfully in La Liga and key part of Pep Guardolia’s plans. But the manager has also commented on the tactical “anarchy” that Fábregas brings to the side, sometimes to eager to get forward and thus relinquishing some of their vice-like grip on matches. Yet, control might not have been paramount in this game and in Manchester City’s case, Roberto Mancini was perhaps happy to cede some possession as he was always going to play through his front four. Nevertheless, Manchester City did have control for large periods of the game with and without the ball and showed ruthless ambition on the break Arsenal did not have. For The Gunners, they lacked spark in attack. They essentially also played with a front four although the difference between the sides’ interpretations was noticeable. Gervinho made his best performance in an Arsenal shirt in terms of involvement, attempting 48 passes (42 successful) and was generally Arsenal’s biggest threat. But he, like the rest of the team, lacked end product. The Gunners looked best when he got involved, often linking up with Robin van Persie and taking up his spaces but while it highlighted what was good about Arsenal, it proceeded to show what could be better. Because City’s front four did it better. David Silva jinxed and drifted from his right-flank and that dragged Arsenal’s defenders this-way-and-that. When he vacated his right position, Mario Balotelli often took up his space. If he didn’t, Sergio Aguero did. Samir Nasri also had a neat game and the goal was perhaps the only time, in an attacking instant, where the coaches tactical plan paid off. Manchester City won the ball back and suddenly the front four darted into life, breaking with speed before Silva anticipated Balotelli’s shot. It’s generally difficult to defend from breaks – highlighting why Arsenal are often punished despite the paucity of chances they concede; most are quick breaks/counter-attacks – but Laurent Koscielny’s confusion summed it up as Nasri played the pass to Balotelli, somehow popping up on the left. They did it in the Carling Cup and Mancini’s selection, choosing Kolo Toure at centre-back to read Arsenal’s attacks, indicated he wanted to do it again. 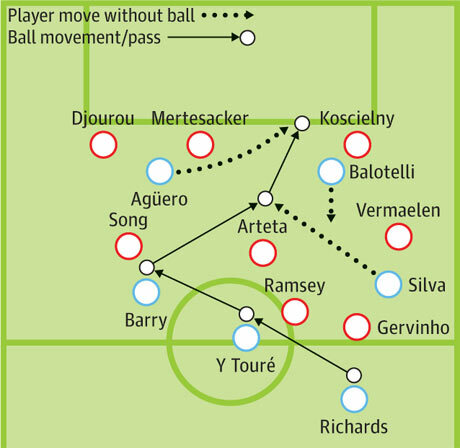 While City’s attack interchanged and buzzed, Arsenal’s jerked and in the end, was too functional. Aaron Ramsey often found himself in dangerous pockets but lacked the movement to deliver a telling pass. Theo Walcott, on the other hand, isolated himself on the right-flank and when he did get into good positions, was not found. This was not a bad Arsenal performance but just a bit short of Manchester City’s exuberance in possession. Wenger has decided to go with a three striker policy although in the meantime, it’s alienating Yossi Benayoun who would have revelled in the spaces “between-the-lines.” The tactic depends 1) on technique, which Mikel Arteta has provided, 2) on movement, which had usually come from the midfield three rotating but Wenger, in the last three games, choosing to play closer a 4-2-3-1 and 3) creativity, which Ramsey wasn’t too comfortable with and Alex Song unable to break forward as he has. His pass which found Gervinho in the first-half was an uncharacteristically rare moment of incision. Arsenal clearly suffered without any full-backs and when they did push forward in the second-half when the personnel changed, they were punished on the break. That’s why Wenger has pushed Ramsey forward more recently although this time, his tactic failed to pay off. If they had either one of Andre Santos or Bakary Sagna, Arsenal might have been more confident of getting at least a point. As it was, both sides pressed without achieving the desired impact, creating a game of pass the parcel. It was up to, then, the two front fours to decide the game and it was David Silva who came up with the clincher, causing anarchy to Arsenal’s defence. Pass masters: Both teams’ main threat came from clever passes, Sergio Agüero in particular making shallow runs to beat Arsenal’s defence. *NB: We couldn’t produce an image better than The Guardian’s to illustrate the article so we stole their’s instead. All royalties will be paid to the trustees of the media group in due course. When we actually make some money from this site. If we do. Actually, we lose more money than we make.